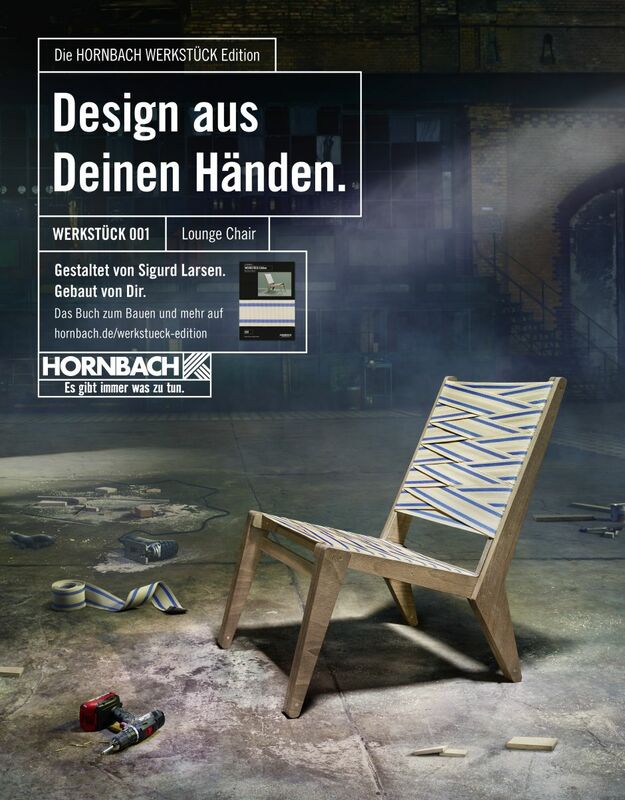 The ’Hornbach WERKSTÜCK Edition’ is a new furniture design series, created by Hornbach, designed by well-known designers – and crafted by you. For the very first time it´s now possible for everyone to build a piece of furniture design with the special support of Hornbach. A two-film-campaign, including an ’Aesthetics Spot’ (30’’ & 15’’) and a ’How To Instructions Film’, is accompanying the ’Hornbach WERKSTÜCK Edition’ premiere of No. 001 – The ’Lounge Chair’ by Danish designer Sigurd Larsen. Simply buying it would be far too easy. You have to build it. Concept and direction of both films including an overall audio production. Three ADC Awards, categories ‘Integrated Communication’, ‘Digital Campaign‘ and ‘Promotion Action B2C‘, at Art Directors Club Awards 2018, Hamburg. Silver Award, category ‘Branded Content & Entertainment’, at Die Klappe 2018, Hamburg. Silver Award, category ‘Direct Marketing/Brand Design’, at Clio Awards 2018, New York. Two Silver Awards, categories ‘Branded Content’ and ‘Client Promotion’, and Bronze Award, category ‘Direct Marketing – Consumer’, at London International Awards 2018, London. Two Silver Awards, categories ‘Integrated’ and ‘Brand Experience & Activation – Customer Acquisition & Retention’, and three Bronze Awards, categories ‘Direct – Experience Design’, ‘Brand Experience & Activation – Retail’, ‘Brand Experience & Activation – Launch/Re-launch’ at eurobest 2018, London.